A public consultation is to be launched on plans for a national investment bank for Scotland. First Minister Nicola Sturgeon announced the move at a conference on "inclusive growth" in Glasgow. The establishment of a Scottish national investment bank was included in Ms Sturgeon's programme for government, revealed in September. Views will now be sought from the public on the detail of how the bank can support the Scottish economy. Tesco Bank chief executive Benny Higgins has been appointed to head up a plan for its implementation. Ms Sturgeon outlined her strategy to grow Scotland's economy and tackle inequality at an event in Glasgow. The conference brought together speakers from international organisations, foreign governments, local authorities and academia to discuss Scotland's progress in the two areas. Ms Sturgeon said: "The council of economic advisers identified a national investment bank as an important means of delivering infrastructure development, finance for high-growth businesses and strategic investments in innovation. "Today, we are launching a consultation on the details of how best the bank can achieve those aims and support Scotland's economy. "However, we recognise that inclusive growth is another essential part of our focus on innovation and productivity. "So, we've also announced a range of measures to ensure that as we transform our economy, we leave no-one in our society behind." She said these would include a Just Transition Commission - a panel of experts from across society that will advise on how to make the move to a low-carbon economy as equitable as possible. And Ms Sturgeon said the government would look at ways in which it can support the growth of employee ownership and continue to pursue its "fair work agenda". 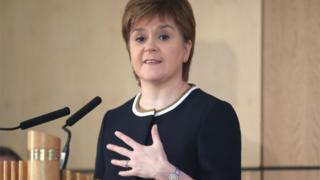 She also vowed to press on with plans to explore a citizen's income scheme for Scotland, while acknowledging it "might turn out not to be feasible". A universal basic income offers all adults a non-conditional flat-rate payment. Models have varied, but in some examples any income they earn over this is subject to progressive rates of tax. Earlier this week, the Scottish Conservatives suggested spending on benefits could have to rise by £12.3bn to cover the costs of such a move - a claim dismissed as "wrong" and "hysterical" by the SNP. Ms Sturgeon said: "I should stress our work on this is at a very early stage. It might turn out not to be the answer, it might turn out not to be feasible. "But as work and employment changes as rapidly as it is doing, I think it's really important that we look and are prepared to be open-minded about the different ways in which we can support individuals to participate fully in the new economy." Responding to Ms Sturgeon's investment bank announcement, Scottish Conservative economy spokesman Dean Lockhart said: "It is simply another desperate attempt by the SNP to distract us from the mess they have made of our economy. "It is a re-hash of a policy first announced several years ago, and then repeated again when they launched the Scottish Growth Scheme last year. "Not a single penny has been received by a business under the growth scheme, and Scottish companies will understandably be sceptical about when they can expect to see any benefit from this latest plan." Scottish Labour's economy spokeswoman Jackie Baillie said it had been a Labour manifesto commitment ahead of June's general election. She added: "While imitation is the sincerest form of flattery, the SNP appear to have only sketched this out on the back of a fag packet." Andy Willox, Scottish policy convener for the Federation of Small Businesses, said: "While there's much to be applauded in the concept of a national investment bank, it shouldn't distract from other pressing matters. "For example, new figures out today show that Scotland's local roads are in an unacceptably poor condition and will continue to decline. "Addressing this sort of unglamorous but chronic problem would win the first minister plaudits amongst Scotland's smaller firms."